The CIK-FIA Competition which took place in Finland at the Mika Salo circuit in Alahärmä provided an exciting spectacle. The unique setting of the Powerpark and the particularly selective layout of this spectacular track gave rise to exciting Races. Contrary to predictions, there was good weather for the two most important days of the Competition. The 2017 CIK-FIA Karting Academy Trophy was brilliantly won by Belgium's Xavier Handsaeme, while positions were set before the final round of the CIK-FIA European Championship and the CIK-FIA European Junior Championship after the superb victories of Sami Taoufik in OK and Jonny Edgar in OK-Junior. Finland has confirmed its legendary passion for motorsport in general and Karting in particular. Kees van de Grint, Vice-President of the CIK-FIA Kees van de Grint has had several reasons to be satisfied with the organization of this Competition in Finland. "I am very proud that the CIK-FIA and the WSK Promotion have been able to contribute to the celebration of the 100th anniversary of Finland by including this Competition in the 2017 calendar. And I must say that it was a particularly successful sporting event. The very fast Alahärmä circuit offered an extraordinary spectacle to the many fans who watched the Races in the stands. It was a long time since I have seen such a significant and enthusiastic crowd during a Karting Championship. The three Finals, starting with the Academy Trophy, then the Juniors and the OKs, were absolutely fantastic. I am convinced that the great majority of the Drivers enjoyed the Finnish track, where the fast circuit offered several possibilities to pass, provided that they had the will. It is a real racing circuit, among the most interesting and spectacular of today." “As Jean Todt, the President of the FIA, reminded us during his visit to Alahärmä, safety should be the first concern in Motor Sport. I would like to acknowledge the effectiveness of the measures taken by Franz Schreiner, the circuit safety officer at the CIK-FIA, to make the Finnish track safer. I personally realised during the Races the important role of the protective barriers which were strongly insisted on during its inspection. I would also like to thank and congratulate the owner of the site, Jorma Lillbacka, for his remarkable responsiveness and investment in improvement of the racing conditions." Returning to the Competition itself, which took place far from the regions usually visited by our Championships, we must underline the variety of the countries represented, some fifty in all, and the cordial agreement that can prevail between participants of very different origins. The CIK-FIA Karting Academy Trophy is an emblematic example of the camaraderie enabled by a sport like Karting. I am also delighted by the superb victory achieved by the young Moroccan Sami Taoufik in the OK category, as well as that of the Briton Jonny Edgar in OK-Junior and the Brazilian Francisco Melo D. Porto in the Academy." The Flying Finn 100 project, initiated by the Finnish ASN AKK Motorsport, reached its final stage on Friday 21st July at Alahärmä in the presence of FIA President Jean Todt. Thanks to the support of many partners and under the patronage of F1 Drivers Mika Häkkinen, Kimi Räikkönen, Valtteri Bottas and Heikki Kovalainen, 100 karts were displayed on the track before being distributed to several Finnish clubs to promote access to racing for young Finnish talents, according to the wishes of the AKK Motorsport, represented by its president Juhani Pakari. Young talents from 12 to 14 years of age in the CIK-FIA Karting Academy Trophy competed in the third and final competition of the season in an excellent atmosphere. At the wheel of their Exprit / Vortex / Bridgestone karts, the apprentice champions fought intense battles at all levels. The Brazilian Francisco Melo D. Porto was very comfortable on the track of Alahärmä to the point of dominating most of his opponents. After pole position in Qualifying Practice, he won two of his three Qualifying Heats before concluding with an undisputed Final victory. The Belgian Xavier Handsaeme closed up on him in the Heats before attempting to take the lead, but to no avail. The Dutchman Tijmen van der Helm came back from 26th in Qualifying up to 3rd position in the Final ahead of the Swede Gabriel Nord and the Frenchman Dylan Leger. Consistently in the top three in the Qualifying Heats, the Moroccan Suleiman Zanfari finished 7th behind Emirati Driver Jamie Day, who set the fastest lap in the race. After discounting two out of six results, Xavier Handsaeme's total of 63 points was enough to win the 2017 CIK-FIA Karting Academy Trophy and to be rewarded with a participation offered by OTK Kart Group, the supplier of Exprit chassis and Vortex engines for the Trophy, at the CIK-FIA World Junior Championship at PF Int'l (GBR) in September. Tijmen van der Helm (49 pts) was 2nd and Francisco Melo D. Porto (41 pts) 3rd. 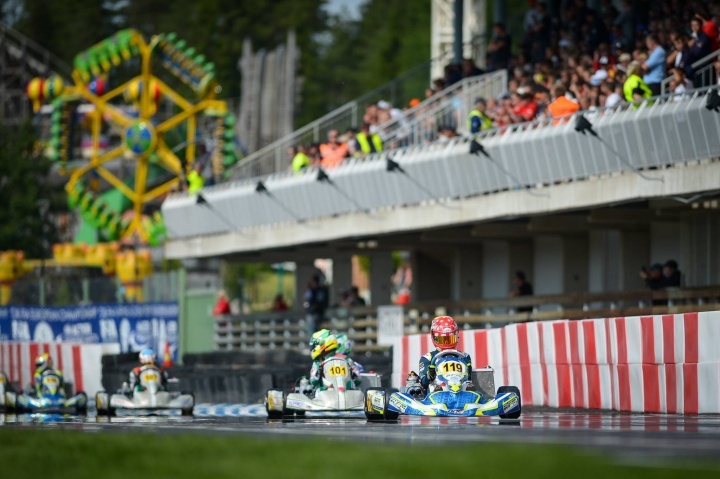 The CIK-FIA European Junior Championship continues to produce a thrilling spectacle punctuated by adventures. The strong man of the start of the Alahärmä OK-Junior Competition was without a doubt Jack Doohan (FA Kart / Vortex / Vega). The fastest Driver in Qualifying Practice, he also dominated the Qualifying Heats. However, two rivals followed him closely at this stage, staying in the same order: Harry Thompson (FA Kart / Vortex / Vega) 2nd and Jonny Edgar (Exprit / TM / Vega) 3rd. The 21 laps of the Final were to change the game. Edgar was back up to 2nd place before attacking Doohan, who responded. Edgar's second attempt four laps from the finish was the right one and he was able to head to a great victory. Ilya Morozov (Tony Kart / Vortex / Vega) then threatened the Australian, soon followed by Thompson who finished on the podium, while Doohan had to settle for 4th place ahead of Hadrien David (Zanardi / Parilla / Vega). O'Neill Muth (Zanardi / Parilla / Vega) had long-term difficulties in Finland and qualified last for the Final, gaining 22 places to finish 12th. With his 94 points, Jonny Edgar confirms his position as leader in the provisional classification of the Championship before the denouement in Sweden one week after Finland. Harry Thompson (70 pts) is still 2nd, Hadrien David (59 pts) has taken 3rd ahead of O'Neill Muth (53 pts) and Christopher Lulham (42 pts). The 2017 CIK-FIA European Championship has certainly not been short of twists and turns. At Alahärmä, Paavo Tonteri (Tony Kart / Vortex / LeCont) was a favourite on his home territory after pole position in Qualifying Practice. Defending champion Pedro Hiltbrand Aguilar (Tony Kart / Vortex / LeCont) took the lead at the end of the Qualifying Heats, but Tonteri was still on his heels, while Pavel Bulantsev (Tony Kart / Vortex / LeCont) was 3rd. But in the last Final, a Driver sprang from 7th place and took the lead from the second corner. Sami Taoufik (FA Kart / Vortex / LeCont) had played a master card there. The young Moroccan Driver had not yet won the race while Tonteri gave him a hard time. But it was Bulantsev who managed to overtake him and move into 1st place. Taoufik did not see it that way and recovered his lead shortly afterwards to ensure a historic victory for his country. Bulantsev and Hiltbrand were on the podium with him, while several notorious retirements changed the look of the championship. Sami Taoufik also took the lead in the provisional standings with 64 points, ahead of Pedro Hiltbrand Aguilar (56 pts). Despite a lacklustre competition, David Vidales Ajenjo (52 pts) is in 3rd place and Theo Pourchaire 4th, with Pavel Bulantsev 5th. The conclusion of the Championship be at the end of July at Kristianstad (SWE).